A motorcycle is a piece of metal and other materials on two wheels. Yet so many people shrink away from even the simplest maintenance, thinking it’s beyond them. Motorcycle maintenance is objective and rational, with no human emotions to complicate things. When sparked to life, power is created. Basic components assembled into a logical sequence make it run — not unlike the human body. But those components need care and attention for the human or mechanical machine to operate effectively and not wear out prematurely. Air filter. Air is drawn through the filter and mixes with gasoline to provide the right fuel mix. If the filter is dirty and enough air can’t get through, mileage and performance drop. While it’s true, you also need good clean air, it’s also important to filter out those negative thoughts and emotions so they don’t usurp your energy. Oil and filter. Motor oil is the lifeblood of your engine. There are many parts moving rapidly (check your tachometer to see just how quickly) and without that lubrication, your engine will seize. Over time, dirt, debris and particles, which accumulate in the oil, are kept from damaging the engine as the oil passes through the filter. Regular oil and filter changes are the simplest, least expensive way to produce longevity. Byproducts of metabolism can build up in your body and it’s important to give it adequate rest and nutrition. While you can’t change your oil and filter, you can take steps to let only healthy ingredients into your body. Cables and wiring. These are a bike’s internal communication system. They transmit signals and power through an intricate assembly. It’s much like your nervous system that collects information to help you react, think and function, then sends out the appropriate instructions to the applicable body part. Frayed wires or worn cables need to be replaced or the signal won’t get through. Gauges. Speedometers, tachometers and the like, give an objective reading of how the engine is performing and guide your behavior. It’s not such a straightforward read when it comes to assessing how your body is performing, although it will “read” differently when you are unwell, angry or upset. Tires. Two small contact patches keep you grounded and upright. Make conscious choices to spend time in activities that ground you. Losing that connection risks body, mind and spirit. 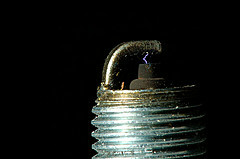 Spark plugs. These marvels generate the spark that meets with fuel to create combustion, which causes your engine to run. No spark plug, no combustion, no running engine. You have something that ignites your passion too. Pay attention to what that is and follow it. Keep the spark alive. Drive chain. It’s great to have all that power in your engine but sitting there idling won’t get you down the road. Your motorcycle will have a mechanism to transmit power from the engine to the wheels. Drive chains (and the sprockets they mesh with) wear. Keeping chains clean, lubricated and at the recommended tension extends their life and prevents engine wear. Words and behaviors put your power into action. Experiences trigger emotions range from anger, fear and worry to love, compassion and joy. Your response is up to you and will determine how your power is transmitted. Brakes. They stop or slow you down to avoid danger. They also wear over time and need to be replaced so check them periodically. Know your own safety mechanisms and how to recognize when they’re not working for you. Battery. Simply, it’s a holding unit for the power that allows your engine to start and powers peripherals. If it can’t hold power or isn’t kept charged, it dies. Pay attention to your own energy level and make sure you’re replenishing it. It’s a balance, and often easier to give than to receive. Performing basic maintenance on your motorcycle is not difficult and gives you a whole new appreciation for its capability. And it’s a great teacher. Learn from it. You can apply the same lessons to your life.